This summer, I’ve been privileged enough to live and work right outside of Denali National Park. It’s beautiful and amazing, and because of the company I work for, I get six free bus rides into the park. So at least every other week, I ride the bus into the park with the tourists to see the animals and hopefully catch a glimpse of the mountain. I usually jump off and backcountry hike with my husband, but we’re always on the bus for the rules section. A lot of the rules make sense, such as be quiet at wildlife sightings. And don’t eat at the rest stops. I mean, people still don’t follow the rules, but it’s easy to see where they come from. But this year there’s been a new rule. Don’t shove your selfie stick out the window at wildlife sightings. I mean, I get the rule. But did someone really shove a selfie stick out the window at a wild animal? Did the animal bite the selfie stick? I need to know what happened! And I can’t find a damn person who knows the origin of the rule! And it’s not just Denali that’s killing the selfie stick. Disney has recently banned selfie sticks due to safety concerns in the park. Did someone try to selfie on Splash Mountain? Did some idiot almost become the thousandth ghost at the Haunted Mansion? I need to know the reason for the rule! It’s driving me crazy! Remember that time my husband got a bunch of strangers chased by a moose? Oh you don’t? That’s fine, I do. ‘Cause it was yesterday. There was a big storm predicted for the area, so rather than go on one of our epic adventures we decided to stay closer to home. It’ll be fine, we thought. Much safer, we thought. We did a little hike where we found a cute little pika and were turned back by a closure for bear activity. And then we went down to the good old lake trail. The one where the elderly tourist go because it’s safe. On our way down, the people going up kept telling us excitedly about how there was a moose at the bottom. We kept responding with how we would be very careful, trying to emphasize to the tourists that moose can be cool, but they can also kill you. A mama moose is the most dangerous animal in Denali Park after all. We were almost to the bottom when we saw the little moose cross the trail. We backed off to a respectable distance and waited for the mama to follow so we could continue on our way. We kept hiking around the loop. We saw two beavers pulling trees through the lake and then, low and behold, we saw that same mama moose in the water, just chompin’ away at the weird grass at the bottom of the lake. We had to keep circling the lake to get out, and the plan was to pass quickly and quietly behind the mama and the baby. It’s me again. Megan’s husband. I’m here with a public service announcement. Already this summer, there have been at least three moose stompings in the boundaries of Denali National Park by the same cow moose. And yet, you know the true problem? People become idiots when they have cameras hanging around their necks. I should know. I have a camera and have charged toward wildlife before. 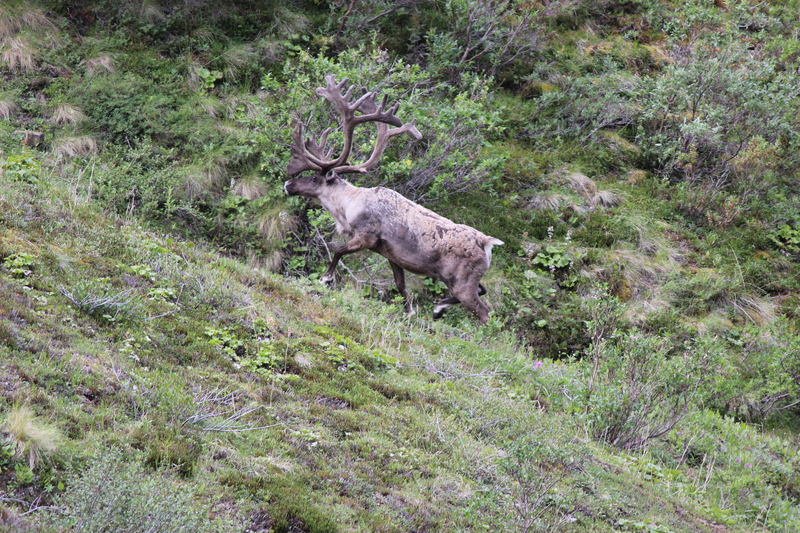 Granted, it was a caribou and was running the opposite direction before I ran forward by just a couple of feet to get on a rise to take a few photos. Here’s one that I got last year (sorry if you’ve seen this photo from me before)! But I digress. The main reason for my soapbox this morning is this: if you have been warned against approaching an animal and that they can and will charge you if they are feeling harassed (which I guarantee you all who were at this location had been), don’t approach the damn animal to get a better shot! Ok, who knows? Maybe not all of these people were approaching wildlife. I’ve just seen too many tourists getting out of their cars and approaching moose to think that these stompings weren’t due to stupidity on tourists parts. In short, please be careful when approaching wildlife. If it looks like it could kill you, it probably can. Stay… in… your car! That is all. Last Saturday we had a lovely, gorgeous, uneventful hike. And then the Asians came.